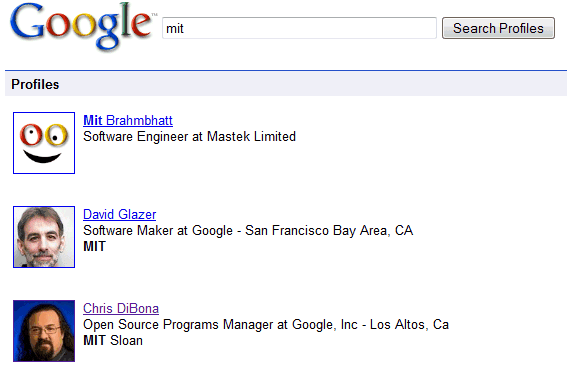 You can now search Google profiles to find people who entered some information about themselves in their public pages. Google shows a thumbnail and a snippet from the profile, but you can't restrict the results to a certain location or to people who worked for a certain company. To make your profile more findable, Google recommends to "add information about yourself on your profile so people can find you when they search by keywords associated with your profile. For example, include details such as the name of your hometown, your job title, where you work or go to school". In addition to this specialized search engine, profiles can be indexed by any search engine and Google makes this easier. Yahoo has recently updated user profiles to make them more social. "Yahoo! Profiles is a centralized control panel that lets you manage your identity, activities, interests, and connections across Yahoo! — and eventually the entire Web." The next challenge is creating an universal profile attached to a digital identity that gathers and filters all your disparate activities from the web. The move towards OpenID, OAuth, the integration of OpenSocial in Google's properties, the launch of FriendConnect are pieces from the same puzzle. The next thing that needs to happen is for more people to be comfortable actually being found on the Internet using their real name (as I am not). the more you connect these things up the more likely it is at some point that you reveal everything about yourself by one slip of a setting somewhere. Is there a guru at Google making sure that by posting my blog or photos under a pen name I don't in some way make available my medical records, even if I think I've isolated the two things? I have yet to see evidence that someone at Google is minding a barrier of privacy between what I am willing (and should be willing) to share and that which I am not willing (or should not be willing) to share. It looks muddled to me, and of course it isn't only Google making it so. The question isn't one of intent (are they evil?) the question is one of competence, and in this arena they need to be almost infinitely competent. Passwords having gotten out can be changed. Much less easy to change your home address and impossible to change your medical status or criminal record. What possible upside can compensate for all the possible downsides? And I say all this as a longtime supporter of Google. I just don't see evidence that they are paying attention to where these things could go. I disagree with macbeach although there is one point that Google and everybody else really needs to get built deep into the system now: the difference between self and identity. 'Self' is me, the one that is typing this right now, the one who sleeps at night in my bed, who I'm with in the shower. 'Identity' is my portrayal to the rest of the world. For instance, as a business person, I'm interested in social network applications. As a programmer I'm interested in Django programming. As a voter, I'm a fiscal conservative who voted for Obama. I may not mind if some of these identities leak into each other - for instance between programming and business. However, if I were being funded by a strong McCain supporter, I might want to show my Obama support broadly but without interfering with my business identity. This has been a problem for time immemorial and there have been many ways of solving it. The Federalist papers were written by a few different authors - James Madison being one of them. However, he wasn't in a position to put his name next to his writings - he needed to use a pseudonym. Nonetheless, this pseudonym couldn't be a one-off name - it needed to be used on multiple essays in order to build a reputation. People who like an author, want to read more by that same author - so there needs to be continuity with regards to identities. They need to be managed. I noticed this very clearly in Disqus recently. They have no isolation between who you are and what your identity is. This is a real problem for a service that focuses on comments. I noticed how somebody, on a technology blog, had also recently commented on a gay city profile site. I presume he's out and he doesn't mind, but if he did mind what could he do. The only current solution is to manage your identities by hand. That will always be the safest option since nobody is as trustworthy as yourself. However, an intermediate step would be better. Google and other like minded companies need to structurally build isolation between 'self' and 'identity' so that users can be logged in with multiple profiles available for any given topic. Hi. Im new to Gmail, and like it so far. Im just wondering, wouldnt it be nice if i could find the member directory, or be able to look up another Gmail member's profile...? I think google is not including the data from google profile right now but may thy will start showing after sometime. I don't know where I'm wrong, but my prfile can't saved and I can't search my profile again. Any help? why it doesnt search profile name on google search? do we need to specifically search profiles through search profile only? I don't know. What if a criminal searches up your profile? Profiles are great for business and awful for privacy. As an online retailer I have found that keeping the business separate from personal is a complex process. My site www.hcgcompletediet.com being a weight loss site I get hit with a million questions a day and then every so often someone will send me a personal email to one of my old Netscape accounts. The profiles are not exactly invading your privacy or anything........ they just display the info that you've approved yourself. I think it's a good idea, people can be found far more easily-think about old friends and lost contacts. The only question is, do we have to search for the profiles separately or will they come up in google results? Honestly... if you want privacy, don't go online. I simply don't understand this discussion of privacy. It's like saying that I don't want to be noticed while constantly screaming in a town square and holding billboards of pictures of my vacation and kids. It's seems beyond ludicrous to me. Well, I've been searching high and low to find out about profiles, but the Google help about it is limited in the extreme. Here's my problem. I've just started using Picasa, and I love it. However, when I upload a web album and make it public, it immediately tells me I have lots of friends who might be interested to see it. Cool - who are they? Well, it *sort* of tells me - there's "Chris" and "Pam" and quite a few others. One or two have albums themselves with pictures I recognise, so I know who they are. But I know lots of people called "Chris". Since there doesn't seem to be any way of finding out who the heck "Chris" is, I don't know if I want to add him/her as a friend or not. This seems a glaring omission! Firstly, how does Google *know* who my friends are (that's scary! ), and since Google obviously knows, is there any way *I* can find out too? wondering how come more people do not have a google profile? I created my google profile today but i am unable to serach it from google. Can anyone please tell me how i can search it and what are the benefits of creating the public profie. how do i look at peoples profile? I also created a google profile but cannot find it. I understand your problem. what is the point of creating something that cannot be found? If anyone can help please respond..
i cant search my profile in google any help? I am fed up with requests for profile.